It’s to a different kind of will that The Legal Genealogist calls attention this morning: not the usual written form that we hope to see with our ancestors carefully setting out spouses and children and grandchildren and who is to receive what ouf ot the estate. Nope, this is a different breed of will entirely, called a nuncupative will. You can think of it as a kind of a dying declaration — the words spoken by a person who realizes that he or she is dying, doesn’t yet have a written will, but wants to say what should be done with his or her property. The theory is that, today, there’s little reason why someone can’t get a will properly prepared. But that wasn’t always the case — and at times when many Americans weren’t literate, when lawyers and clerks were few and far between, and when formalities weren’t as likely to be followed, the law was more forgiving of nuncupative wills. From its earliest statutes, Mississippi recognized the nuncupative will, under very strict limits. Sec. 18. 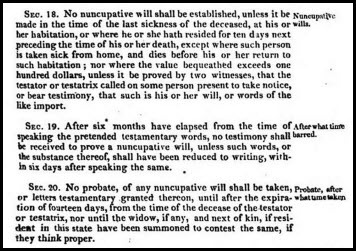 No nuncupative will shall be established, unless it be made in the time of the last sickness of the deceased, at his or her habitation, or where he or she hath resided for ten days next preceding the time of his or her death, except where such person is taken sick from home, and dies before his or her return to such habitation ; nor where the value bequeathed exceeds one hundred dollars, unless it be proved by two witnesses, that the testator or testatrix called on some person present to take notice, or bear testimony, that such is his or her will, or words of the like import. Sec 19. After six months have elapsed from the time of speaking the pretended testamentary words, no testimony shall be received to prove a nuncupative will, unless such words, or the substance thereof, shall have been reduced to writing, with in six days after speaking the same. So to be valid, this dying declaration had to be made during the deceased person’s last illness, at the person’s home unless the person was suddenly taken sick away from home. This limit was to ensure that people from distant areas couldn’t conspire to deprive the rightful heirs of their inheritances. The amount of the estate couldn’t be more than $100 unless two witnesses were called in to hear the person’s dying declaration. No one witness was considered enough for a more valuable estate. Nobody was allowed to come into court and testify about what the person had said in that dying declaration more than six months afterwards, unless the declaration was written down within six days after it was spoken. That, of course, was to limit the opportunity for mischief: “Yes, Daddy left all of his estate to me!” wasn’t going to fly once time had passed. And nobody could rush into court with this oral declaratrion without giving notice to all the heirs, including the widow and next of kin, again to limit the chances of that “Daddy left all of his estate to me!” mischief. So don’t be surprised in a Mississippi probate case to find that a dying declaration served — and serves — the purpose of a will. I ran into one of these “on the way to something else” … it was an estate of a man who was literally run over by a train in Reading PA! Kind of gave me a chill reading that! Wow. Doesn’t get more immediate than that, does it? My 3rd great grandmother had a will like that. The thing I found most surprising was that she left everything to one daughter and another daughter and son in law were witnesses. She was on her death bed and lived a week after writing the will. I can’t help but think she had lost track of her other children by her first marriage. A “cousin” has her death in the family Bible but not married to her second husband. The above daughters were one each from the two husbands. Would they have not put her married name in the Bible for some reason? Since the witness daughter was from the first marriage she would certainly know her mother’s last name. Lots of interesting bits and pieces about that family. There are an awful lot of “what ifs” involved here, Toni. What if she had already given quite a bit to the children of the first marriage? What if those children had ignored her as she aged and only the one daughter was actually in need? There’s so much that isn’t known just from the fact that she favored the one child — the mere fact that another child and that child’s husband were witnesses (and didn’t object) tells you there’s much more to this story. Thank you for sharing this information. I recently came across a Nuncupative Will in Rowan County, North Carolina (1764).